When people complete a home purchase, they're typically pretty excited to move in and make the place their own. Sometimes, however, that new home comes with a good amount of unsightly or out-of-date wallpaper that stands in the way of all kinds of decorating plans. Removal can become a huge chore, and it's the bane of many a homeowner. You could hire someone to take it all down and leave you with beautifully painted walls, but that's an expensive proposition, especially if you have a lot of wallpaper that needs to be removed. You can save a bundle by doing the removal yourself. While it won't top your list of fun projects, at least it doesn't have to be an expensive or chemical-laden job. Here's how to make your own effective wallpaper remover with natural ingredients for a minimal cost to get that wallpaper stripped off the walls and into the trash. Run a wallpaper scoring tool over the wallpaper that you wish to remove. 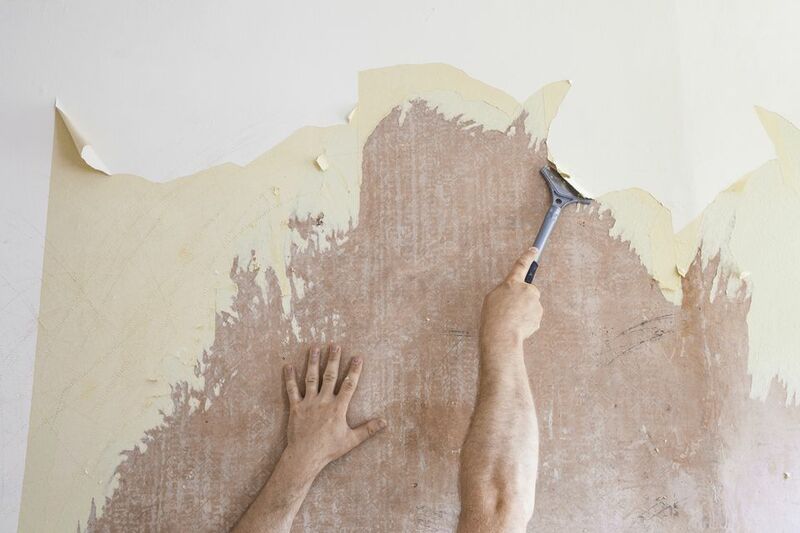 It'll make little perforations in the wallpaper that will make it easier for your homemade wallpaper remover to penetrate the wallpaper paste, but be careful not to go too deep or you'll leave marks on your wall. Alternatively, If you have any loose edges, you can peel off the top layer of the wallpaper. This removes any layer that's impervious to moisture so that when you soak it the paper gets wet right away. Next, mix equal parts vinegar and warm water in a spray bottle or bucket and apply the mixture to the wallpaper liberally. Allow it to soak in for 15 minutes. Then use a scraper to remove the wallpaper. It should come off easily if you've used enough of your remover. The acetic acid in the vinegar acts as a solvent and dissolves the wallpaper paste. It doesn't involve harsh chemicals. You'll have no harsh smells. In fact, vinegar is often used as a deodorizer. It's non-toxic, kid- and pet-friendly. It involves minimal clean-up. Some people use diluted fabric softener, but this method can create a mess and leave behind a chemical residue on your walls or floors. If the wallpaper doesn't come off easily, score the paper again and apply another coat of the vinegar mixture. Have a variety of scrapers ready. Some people use a plastic credit card because it's less likely to damage the underlying drywall than a metal scraper. You might also need a single-edge razor blade to (carefully) get underneath the edges to start peeling the paper. Focus on a small area at a time. This will ensure that you have time to get the paper off the wall before the wallpaper remover dries. If you have a lot of wallpaper to remove, are trying to remove multiple layers of wallpaper, or are just having an especially hard time removing your wallpaper, consider using a hand-held steamer. It uses heat and water to steam the wallpaper off the wall. You just hold the steam plate up to the wall for 10 seconds or so, and it loosens the wallpaper enough that it just peels right off the wall. It's a fairly inexpensive device and well worth the cost given all the time and frustrations it saves. If you're dealing with painted wallpaper, vinyl wallpaper, or lots of wallpaper paste, it's a real game changer. The vinegar trick is great, and when it works it works really well, but the steamer helps loosen up the old wallpaper paste even more effectively to give you a little something extra to get the job done.